IKEA co-workers celebrate IDAHOT (International Day against Homophobia Biphobia and Transphobia), flying the rainbow LGBT+ flag at IKEA Wembley. The retailer is taking this symbolic action to demonstrate its support for IDAHOT and to highlight its commitment to diversity and inclusion in the workplace. 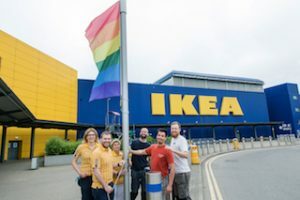 IKEA, which is a Stonewall Diversity Champion and also a part of the Workplace Pride Foundation, will see co-workers and customers celebrating IDAHOT across the country with a wide range of in-store activities. From flying the flag outside every store, to a rainbow photobooth at IKEA Cardiff and rainbow-inspired roomsets and restaurant at IKEA Reading. Research from leading LGBT+ charity, Stonewall, shows that in the UK, more than a third (35%) of LGBT+ staff have hidden or disguised their true selves because they were afraid of discrimination, and one in five (18%) of LGBT+ staff have been the target of negative comments or conduct from work colleagues in the past year. As a humanistic and values led company, IKEA is committed to leading the UK retail sector, championing diversity and inclusion in the workplace and eradicating all forms of discrimination. IKEA believes that not only is LGBT+ inclusion the right thing to do, but it makes good business sense; research has shown that companies with LGBT+ initiatives have seen a decrease in staff turnover and increased customer loyalty. In 2017, the retailer launched its LGBT+ plan which commits to creating an inclusive workplace environment for LGBT+ co-workers. This is supported by IKEA’s broader commitment to fostering a diverse and inclusive workplace. All UK and Ireland co-workers receive unconscious bias training and the IKEA Group also has a goal for gender balance across all management positions.